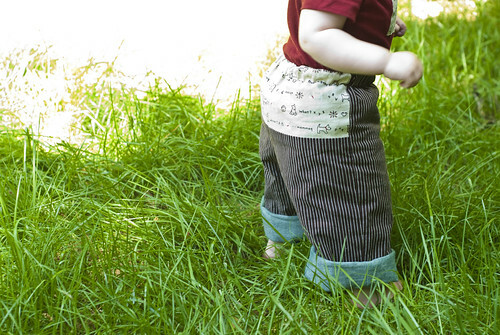 The adorable (and reversible!) 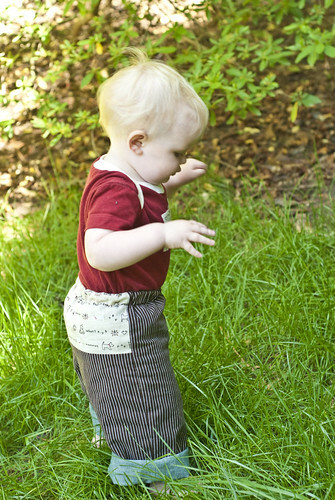 Quick Change Trousers from Handmade Beginnings passed the battery of very stringent toddler tests! Comfortable and cute while walking tentatively - check. Comfortable and cute while marching with stick in hand - check. 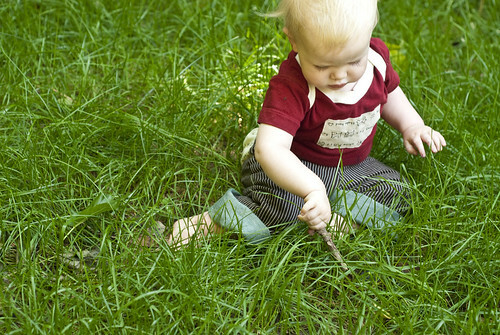 Comfortable and cute while poking stick into grass that's nearly as tall as you - check. 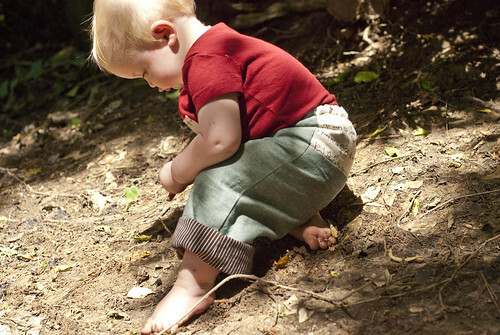 Comfortable and cute while climbing a hill of dirt - check. Comfortable and cute while squishing mulberries between fingers - check. 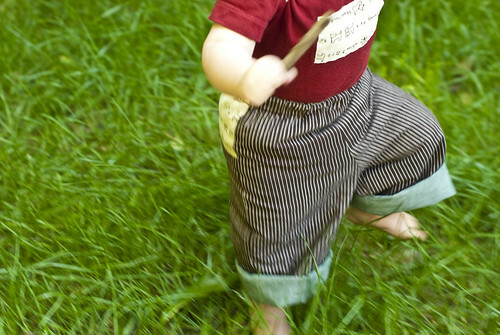 I made a slightly modified version of the trousers to fit over Finn's ample, cloth-diapered rear. First, I made one size up (size 18 months is shown). Then, I modified the pattern piece "C - Back Leg" by lowering and extending the back seat rise by about 1 cm (the adjustments are shown as dotted lines). 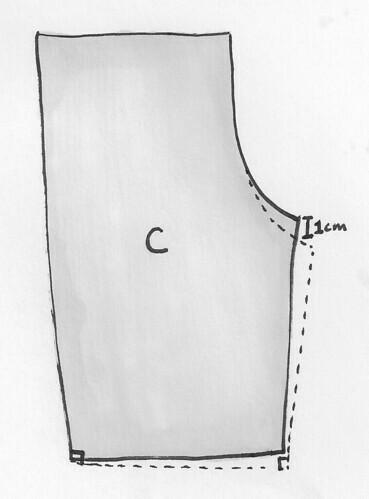 After making this adjustment in the rise, you'll need to adjust for the loss of inseam length by extending the inseam by 1 cm below the cuff. Make your new lines as perpendicular as possible! 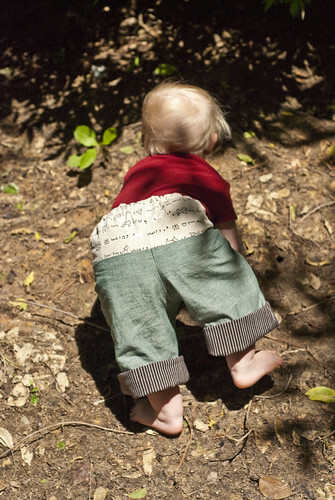 Cut out your new "C" pattern piece and you're good to go - follow the instructions as written, except you'll probably want to use a 1/4" - 3/8" seam allowance when sewing the outer side seams in step 10, just to give a bit more wiggle room around that bulky diaper. I'll definitely be making more of these, both for Finn and for gifts. 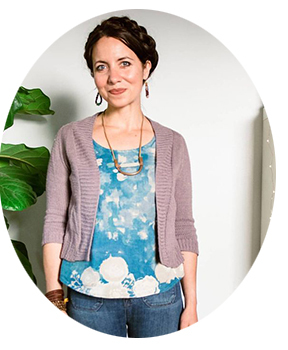 Stop by on Friday for my chat with Anna Maria about mamahood and sewing, and for her tips on sewing with a little one around!